As I mentioned before, I live on a farm with my husband and our 2 sons. They are hard working males and are big eaters. They believe all meals need "meat and taters" so I love finding new potato recipes. 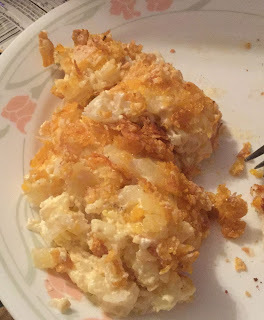 This potato recipe has been around forever and tweaked here and there by about everyone. Some people call these "Funeral Potatoes", some call it "Party Potatoes", and I just call it my Creamy Potato Casserole. no matter what you want to name these, they are always delicious!!! Preheat your oven to 375. Spray a 9"x13" cake pan with cooking spray and set aside. 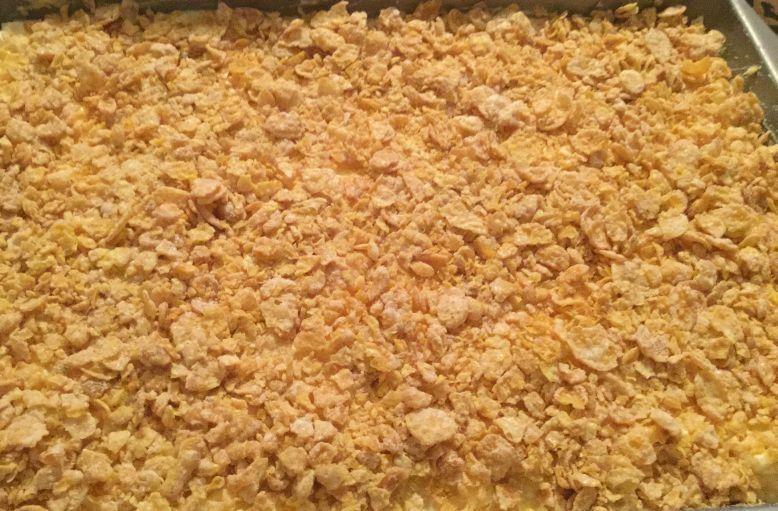 Mix together all the ingredients, except for the corn flakes and butter. 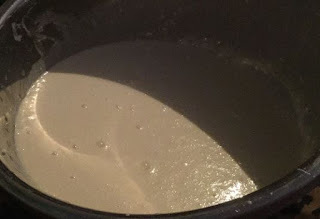 Pour this mixture into your pan. Stir together the corn flakes and the melted butter and then cover the top of the casserole with it. This casserole freezes really well. If I plan on using it for just one meal or to give to someone then I make these up in 3 small (8"x8") foil square pans and freeze them. I first cover the dish with cling wrap and then cover with foil. They last a long while in the freezer this way and do not get frost bitten. 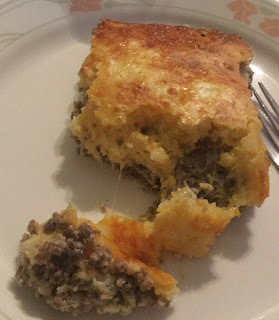 If you spend just a few minutes looking around my blog, it will not take long to notice that I love casseroles. Something about them, I just love. I guess because it is an "all in one dish" meal or that casseroles are usually delicious and filling. Regardless, I make a lot of casseroles. For example, I make a Mexican Tater Tot Casserole, a Chicken Taco Casserole, and a Cheesy Ham & Potato Casserole. Anyway, this is my newest "creation" and by far, it is my family's favorite. In fact, we made it two nights in a row this week! 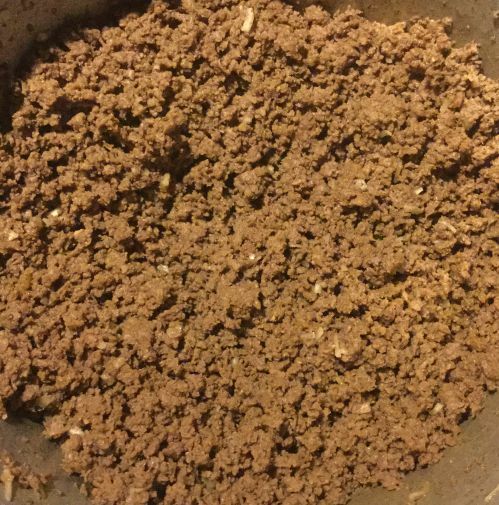 Brown the hamburger meat, garlic powder and onions together. 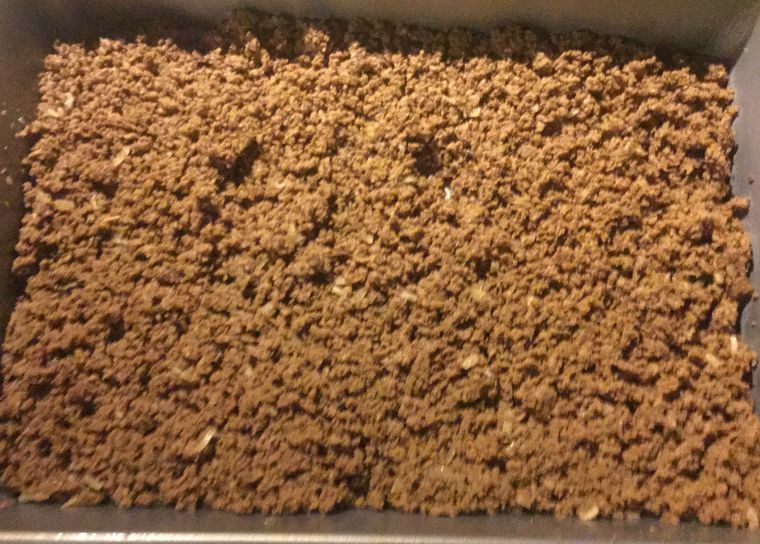 When it is completely browned, do not drain. Stir in the pasta sauce and Italian seasoning. 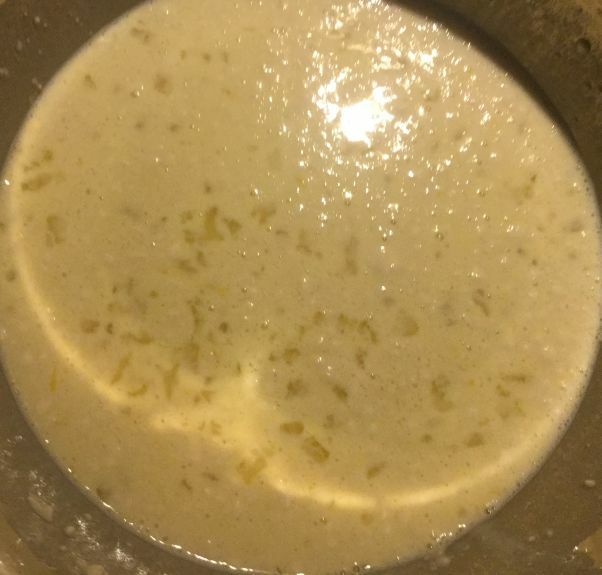 Turn to low and allow to simmer for 5 minutes to give the flavors some time to "meld" together. As the meat sauce is heating up, turn on your oven to 350 degrees. Spray a 9"x13" cake pan with cooking spray. Once the meat sauce has heated, spread the meat sauce into the cake pan. 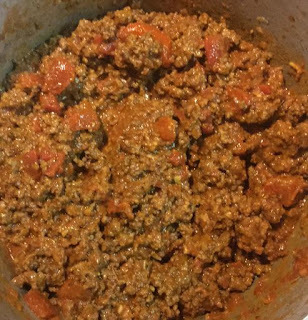 Cover the meat sauce with the pepperonis. Form a nice layer. The photo below is not complete. We added a LOT of pepperonis...the top of the sauce was absolutely covered but add more or less per your own tastes. 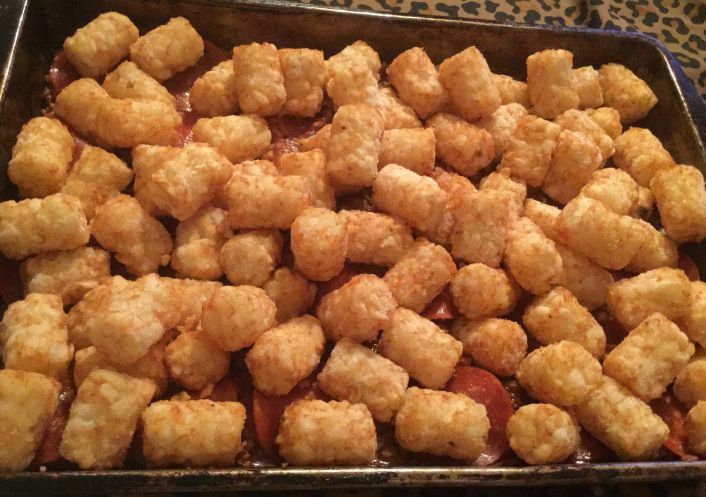 Now, pour on the tater tots and spread them out over the top. Place in the oven and allow it to bake for 30 minutes. After 30 minutes, remove the pan from the oven and spread some more pepperonis over the top and then top with the shredded cheese and Parmesan. Bake for 5 more minutes and then serve. This is an impossibly easy recipe. 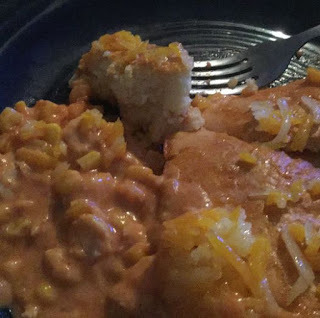 It takes the great taste of chicken tacos and turns them into an incredible casserole. 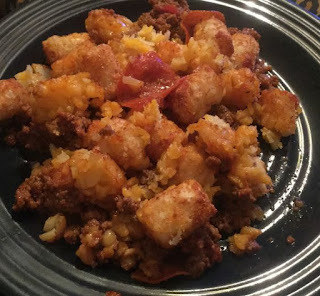 It is loaded with fantastic flavor and it can be on the table in less than an hour. What is not to love?!! Preheat your oven to 400 degrees. Spray a 9"x13" cake pan with cooking spray and then set aside. In a bowl, stir together the chicken, sour cream, corn, soups, tomatoes, onion and taco seasoning. 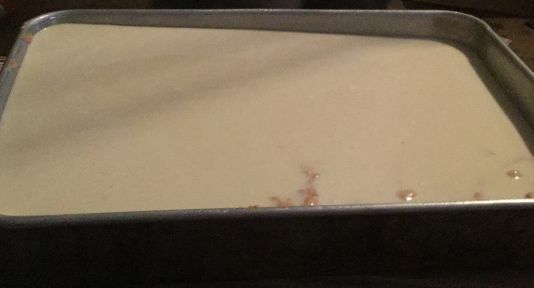 Pour into the cake pan. 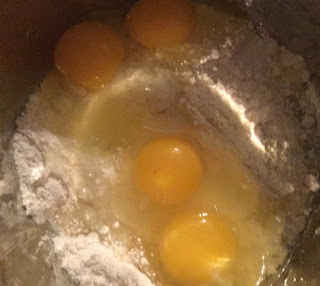 In a medium sized bowl, stir together the baking mix, milk and eggs. Blend with a fork until just mixed. It will be like a liquid. This is how it is supposed to look. 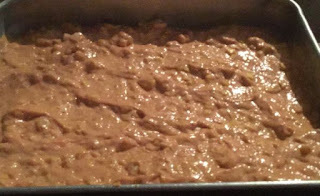 Pour the mix into the cake pan. 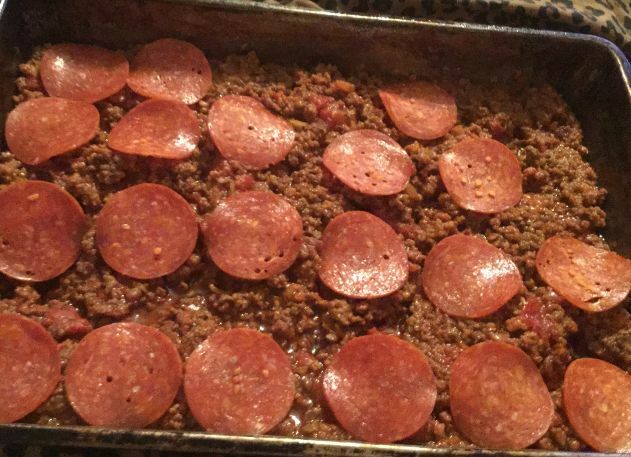 Bake for 32 minutes or until the crust is done. 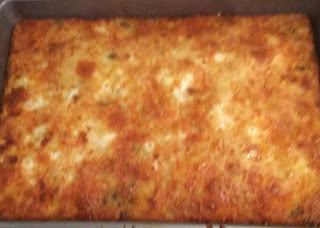 Remove and sprinkle on the cheese and then bake for 3 more minutes. 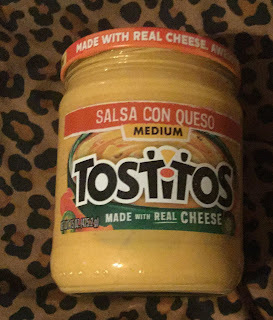 This is great like it is or you can garnish it as you would a taco with your favorite fixings such as sour cream, lettuce and tomatoes. I know this may sound weird or gross but trust me on this. It is delicious and almost addicting. It the perfect snack. It is salty. It is cheesy. It's a bit sour. All the good stuff, all rolled up into one. It truly is the most addictive snack and one in which you never even knew you wanted. Lately, everywhere you look on Facebook and Pinterest are pickles. Pickle popsicles, pickle this and pickle that. 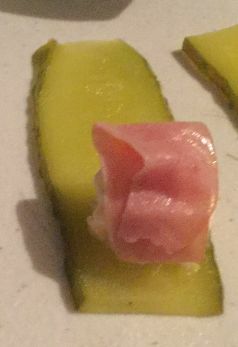 So, why not pickle sushi?! Just one more creative way to eat a pickle that your taste buds will thank you for! 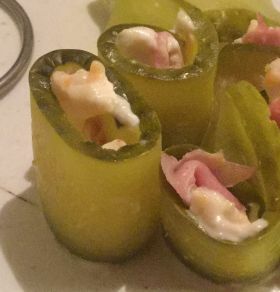 To begin with, cut off the ends of each of your pickles. 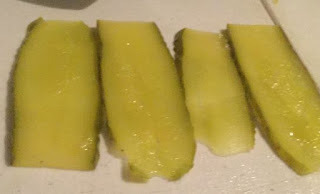 Take your pickle and using a mandolin, slice the pickle lengthwise. Make each slice very thin. If you do not have a mandolin, you can use a vegetable peeler. Either will work nicely. 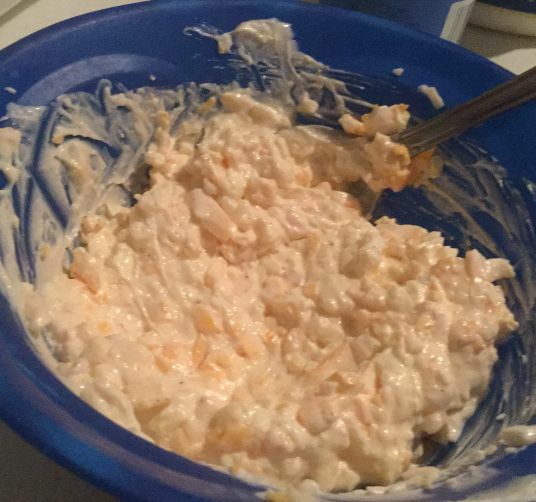 Take a small bowl and mix together the mayonnaise and cream cheese. 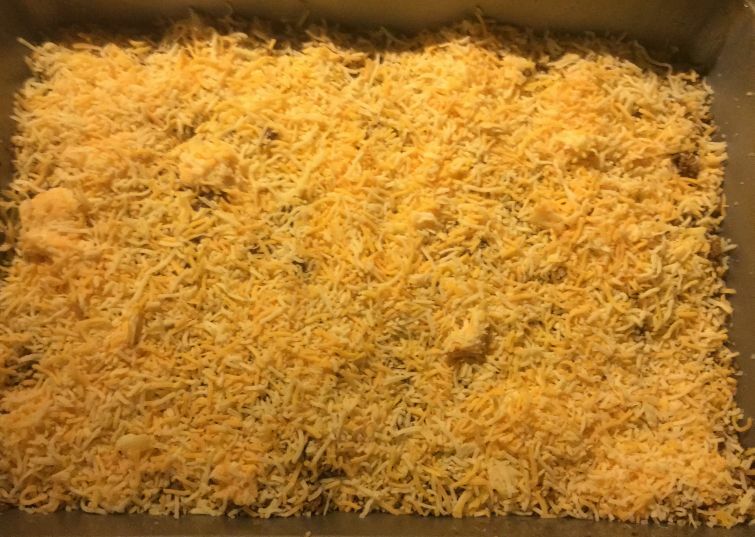 Then stir in the spices and the cheddar cheese. 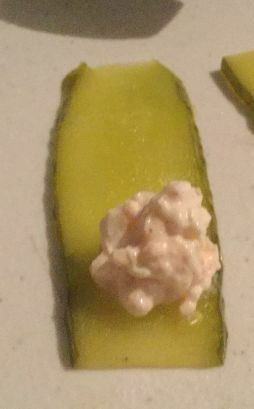 Spread a small amount of cheese onto the end of each pickle slice. 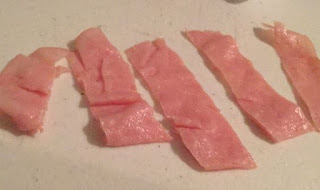 Now take a piece of the lunch meat and fold it in half and cut it into strips. 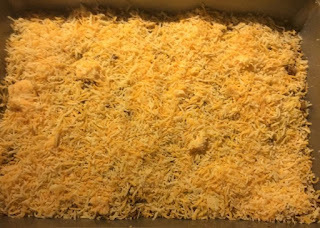 Then roll up or fold up each piece and place one piece onto each pickle slice on top of the cheese. Roll up. You can use a toothpick to hold in place or stack close together and they will hold just fine too. Repeat with the rest of the pickles and enjoy. 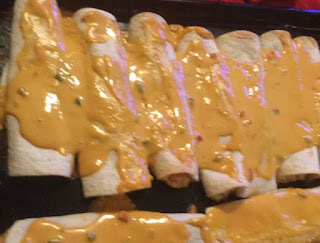 Tastes yummy on their own or dip them into your favorite dipping sauce. Some other yummy appetizers I have made and blogged about include: Homemade Marshmallows, homemade Potato Chips, and Mexican Wagon wheels. This is the ultimate summer dessert. 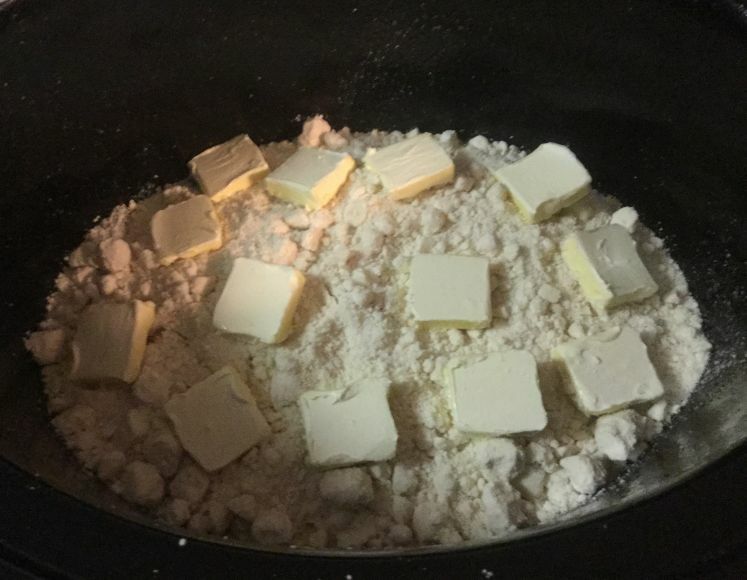 Our family loves dessert but I hate turning on my oven during the hot summer months so why not make a dump cake in your crock pot? 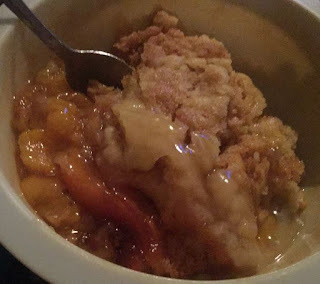 That is what I decided to do and it turns out wonderfully and it only takes 3 ingredients, including some of my homemade and canned apple pie filling!!! 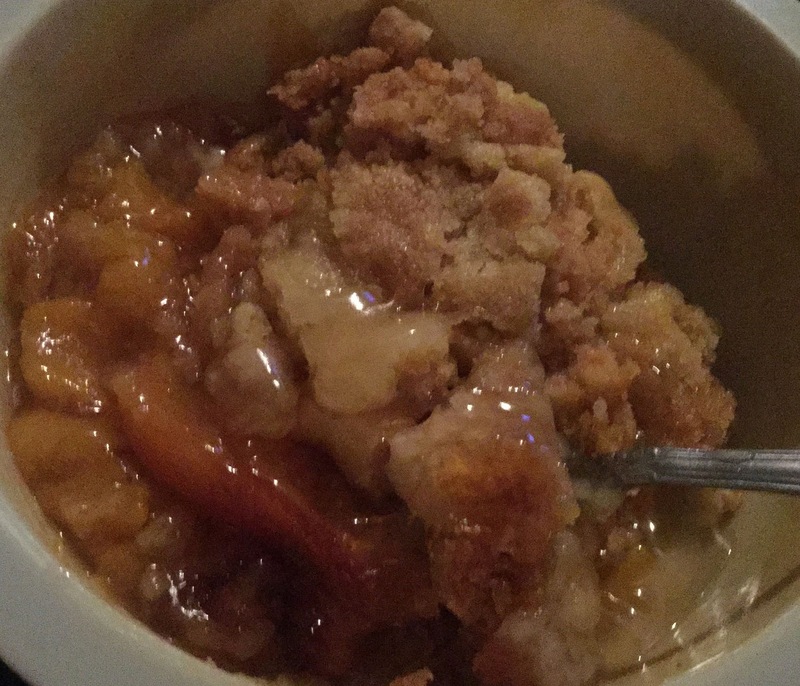 My hubby says this reminds him of a cobbler but since the cake layer is nice and thick, I think a "dump cake" is a more appropriate name for it but call it what ever you want, it is still simple and delicious. ***Note***: If you do not have your own canned pie filling you may use 2 (15 oz.) cans of store bought pie filling. 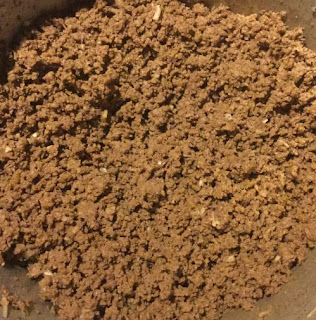 Turn your crock pot onto "high" and LIGHTLY spray the bottom and sides with cooking spray. Pour your pie fillings into the crock pot. Now, open up the cake mix and pour the dry mix onto the fruit. DO NOT STIR! 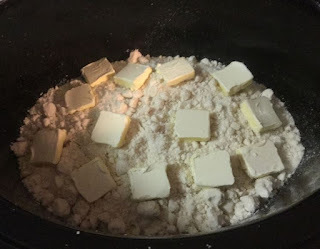 Cut up your butter and lay around the dry mix. Again, DO NOT STIR! Trust me on this. It will be all right. Now, place the lid on the crock pot and wait. Check after 2 1/2 hours and see if the cake is done. Stick a toothpick into the center and see if it comes out clean. 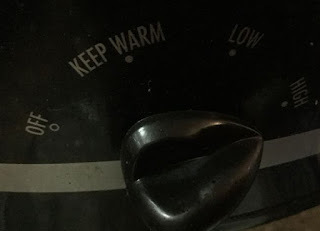 If not, allow it to cook up to 30 minutes longer. The edges will finish baking first but wait until the center is done before enjoying. This dessert is perfect on its own or you can enjoy it warm with a nice scoop of vanilla ice cream! 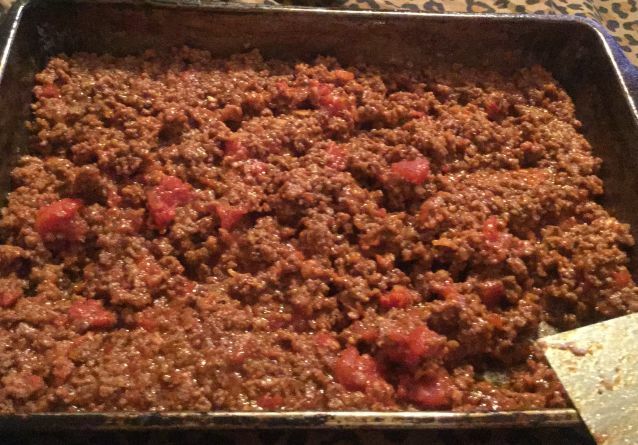 I like to cook from scratch as much as possible because I am trying to stay clear of processed foods for my family. 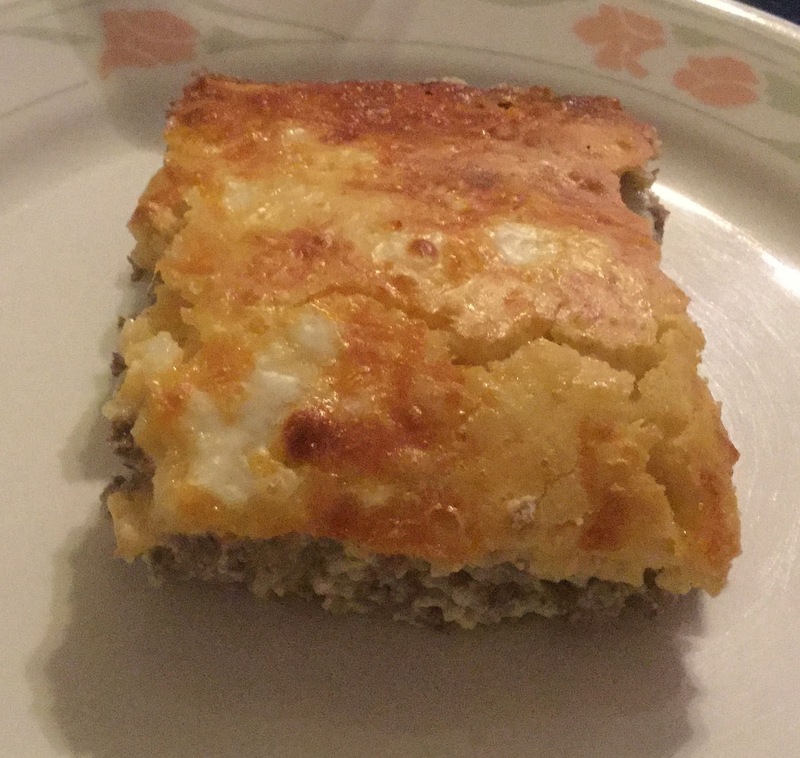 It is not always easy to do but just because you are cooking from scratch does not mean meals have to be elaborate or time consuming or fancy. 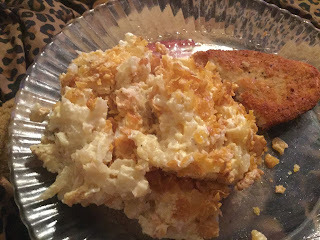 Easy is good too and this is one of those recipes. Preheat your oven to 400 degrees. Spray a 9"x13" cake pan with cooking spray and set aside. 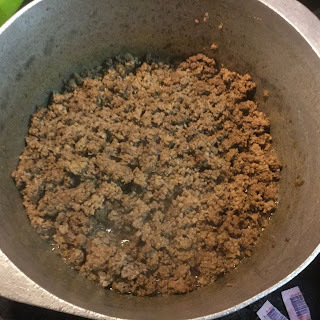 In a large skillet, brown the hamburger meat and onions together. Cook until the meat is no longer pink and the onions are softened. Drain. Stir in the garlic powder and pepper. In a bowl, stir together the baking mix, eggs and milk. Stir well and set aside. 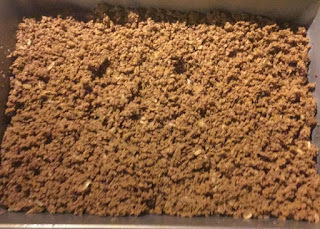 Spoon the meat mixture into the cake pan. 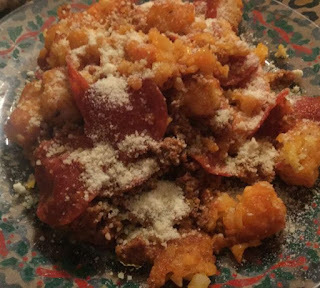 Sprinkle the cheese on top of the meat mixture evenly. Layer the pickle slices around the top of the cheese and then squirt the ketchup over the top. 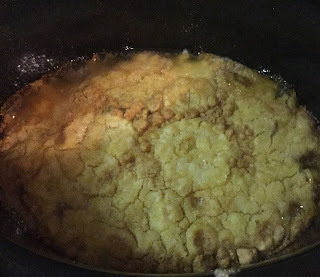 Finally, pour the baking batter over the top. Bake for 25 minutes or until golden brown. Serve with a side of corn. 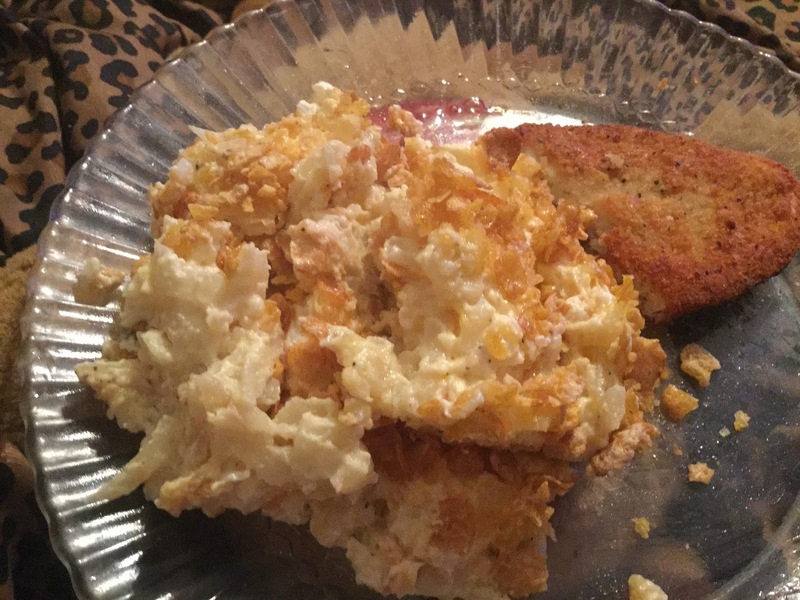 This makes a really good meal that my hubby says I could serve to him every single day. 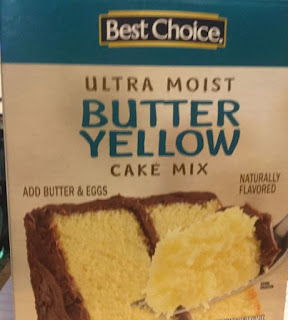 This baking mix is very similar to Bisquick. You can use it to make biscuits, pancakes, etc. 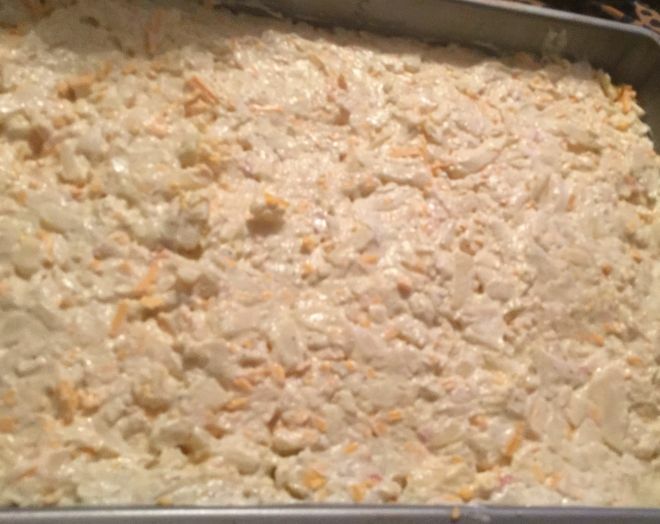 I often use it in my casseroles such as my Cheeseburger Casserole and the Chicken Taco Casserole. Mix the above ingredients together and store in a cool dry place. I keep mine in a mason jar. Use 2 eggs and a cup of milk for every 1/2 cup of baking mix used. 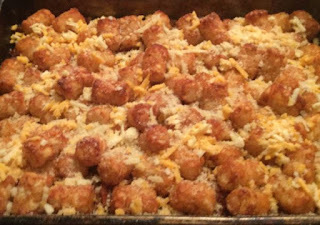 This recipe is easy and one of our family's favorite dishes. It does not take hours to make either. In just 40 minutes, this taste-tempting version can be on the table and ready to enjoy. 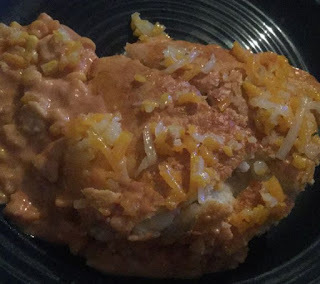 And if you like enchiladas, check out my Beef Enchilada recipe too. Preheat your oven to 350. Spray a large cookie sheet with cooking spray. Set aside. 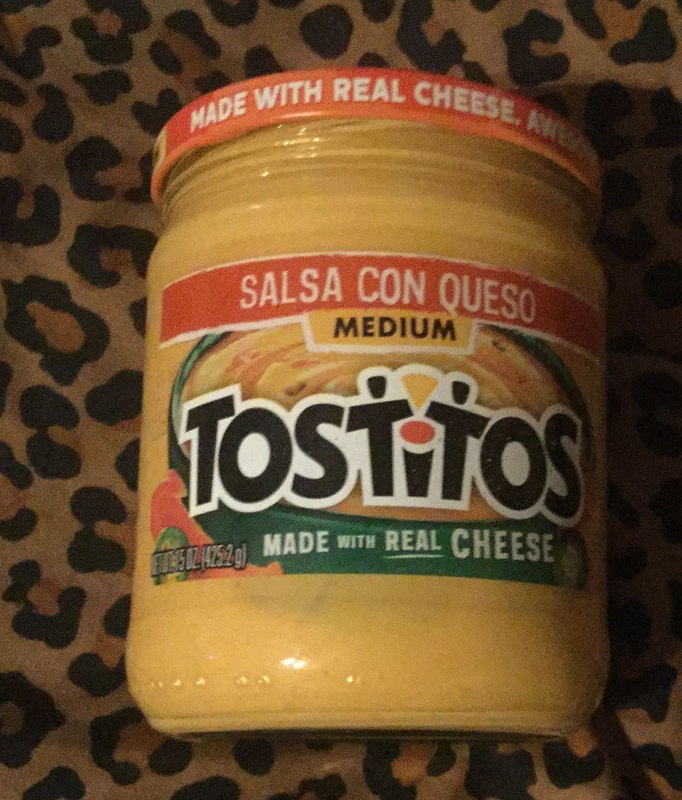 In a medium sized bowl, mix together the cream cheese, taco mix, cheese and milk. 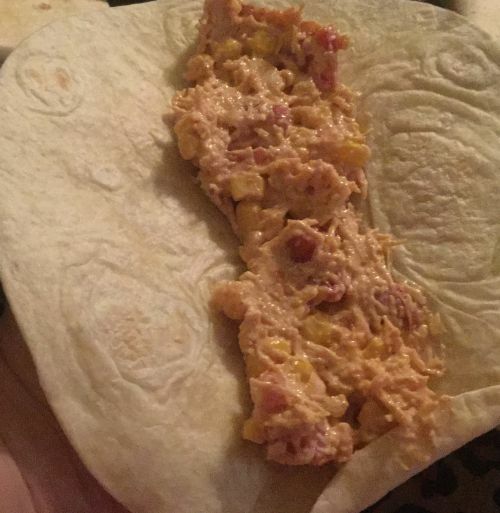 If you want to use canned shredded chicken you can. 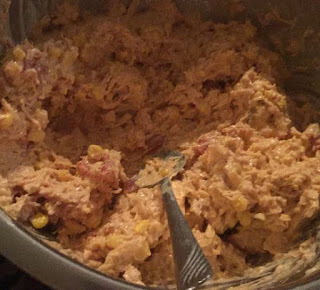 Then stir in the chicken, tomatoes, ranch and corn. If I use canned chicken, I use 2 large cans and 1 small can. 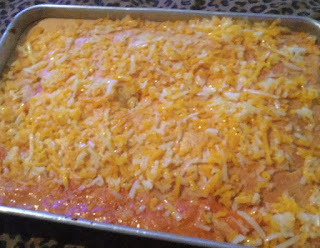 The filling for the enchiladas. 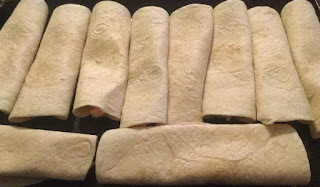 Now, spoon about 1/2 cup of filling (or however much you prefer) onto a tortilla and roll up. 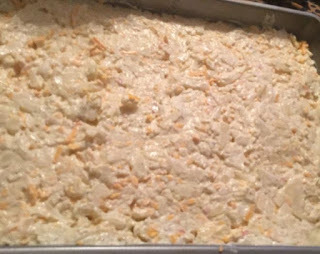 Place seam side down in your prepared pan. Open up the salsa con queso and pour over the top of the enchiladas. Bake for 12 minutes. 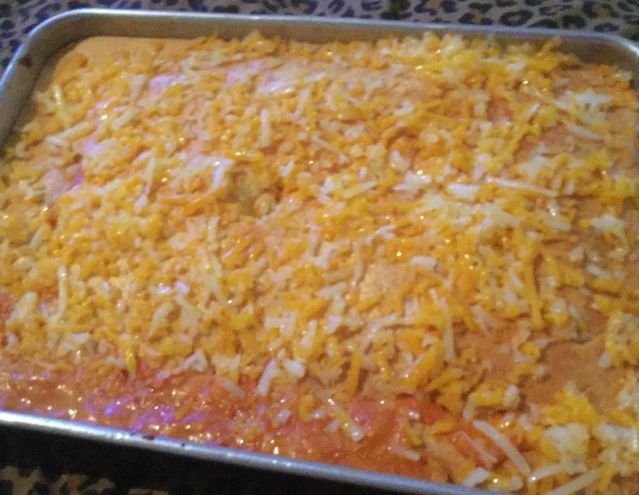 Makes 14 enchiladas. We love to serve this with a side of homemade refried beans. This is a nice and basic dish but the best part about it is that you don't have to cook the rice ahead of time. 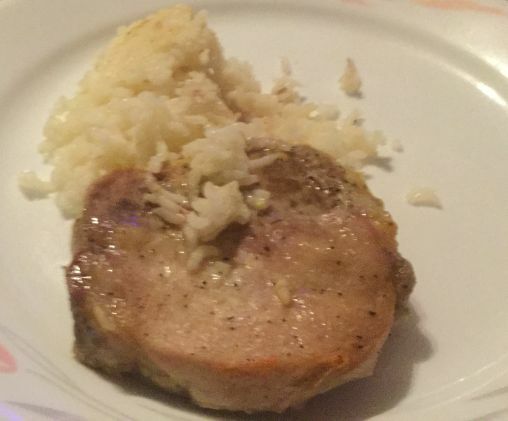 The pork chops and rice cook together in the oven. Easy Peasy. The rice is very flavorful and the pork chops come out tender and delicious. Serve with some potato biscuits or homemade bread and your meal is complete. Preheat your oven to 350. Spray a 9"x13" cake pan with cooking spray. Spread the uncooked rice in the bottom of the pan. Add in the chicken broth and undiluted soup. It will look like a LOT of liquid but it will be soaked up by the rice. No worries. Place the pork chops into the liquid and then sprinkle in the pepper. 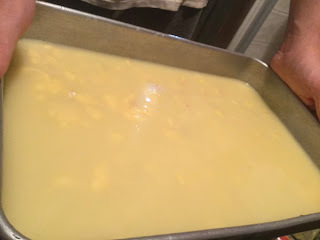 Cut your butter into small slabs and place in the liquid also. 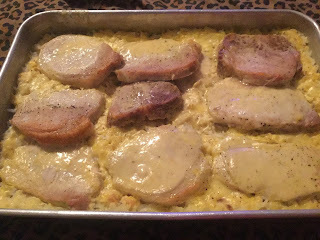 Bake for one hour and fifteen minutes or until pork chops are cooked through and the liquid is absorbed. I used 9 small pork chops...use however many you want. I just generally fill up the pan with them then you have plenty for another meal.